When Rob Guillory co-created one of the most off the wall and well-executed series with Chew, I knew I have to pick up his latest book. 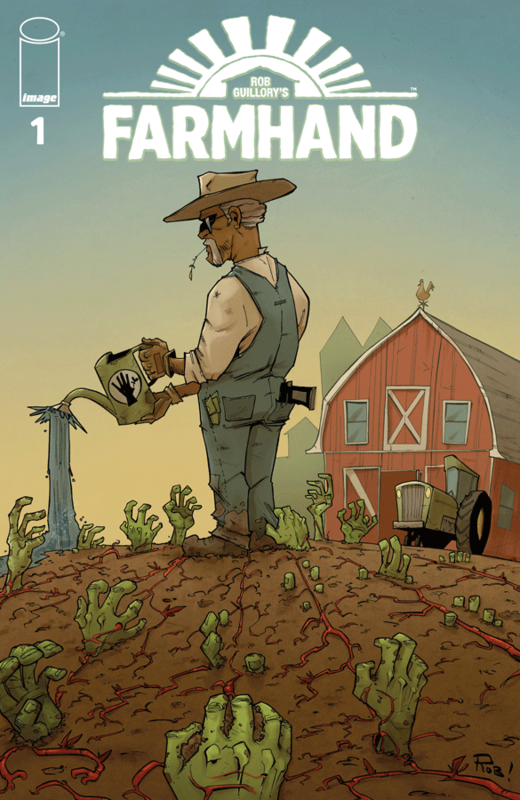 Image Comics’ The Farmhand plants the seeds to a world full of intrigue, mystery and the weirdest crops you will ever see, and that is saying a lot if you are a fan of Chew. Created, written and drawn by Guillory with colors by Taylor Wells, this issue defied my expectations. Jedidiah Jenkins is a farmer— but he farms a lot more than carrots or corn. No, he grows limbs… let that set in. Jenkins Family Farm went from the traditional ways to being a “farmaceutical stem cell research” rock star. He creates farm-grown, transplant-ready organs, but something is a bit off the level. When Jed’s son Zeke comes to visit with his family to make amends from past family drama, he is in for far more than he bargained for. The book is eerie, funny but all in a very entertaining way. You want Jed to be on the level, he seems like that cool of a dad. But when we see what transpires behind the scenes, it’s hard to imagine there isn’t something darker as the driving force. The book is laid out with an awesome introduction, as the readers get the full backstory on the farm as Zeke’s kids learn about it. Guillory’s art is in the same vein as Chew, which I love. The character designs are great, and the produce designs are even better and weird. I love it. This is how you kick off a series. With mystery, with more than meets the eye, but with enough shocking moments to make the reader wish the second issue was out already. Rob Guillory has created something that can cross mediums in the media world if he so chooses: I can see this being a wicked animated series, and it’s only at issue #1. The story has heart… and eyes, and thumbs, and every other body part you can think of. Check out The Farmhand, and get ready to harvest an excellent debut.